February 24th, 2016 | News and Events, Wheaton World Wide Moving. 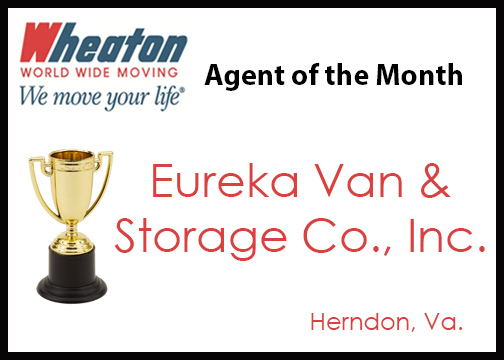 HERNDON, Va. – Eureka Van & Storage Co., Inc. is Wheaton World Wide Moving’s Agent of the Month for January 2016. The award is given to the interstate agent for Wheaton World Wide Moving that exemplifies founder Earnest S. Wheaton’s philosophy of putting customers first and the characteristics of quality, professionalism, empathy for customers, fellow agents, drivers and Wheaton employees. Eureka serves the greater Washington, D.C. and Northern Virginia area. Eureka operates from 70,000 square-feet of warehouse space and is managed with a customer first philosophy since 1979. Eureka can be a single source for all of its customers’ relocation needs. The company handles all aspects of relocation from packing, loading, and transportation of household goods for individual residents and their families – both locally and long distance – to corporate relocation of employees for large corporations. Eureka Van & Storage also does a robust commercial business relocating businesses and their office equipment as well as furniture, fixtures, and equipment for a variety of industries. Eureka is well known throughout the area for their outstanding customer service. Eureka maintains an A+ rating with the Better Business Bureau and has earned the distinction of ProMover with the American Moving & Storage Association. Eureka was awarded Wheaton World Wide Moving Agent of the Year in 2014 and 2002. The company is a member of the Greater Reston Chamber of Commerce, Virginia Recycling Association, ARMA International and National Capital Area Council. Eureka is the official mover of the Washington Redskins of the NFL. Eureka Van & Storage’s corporate office is located at 2768 Towerview Rd. in Herndon. They can be reached at 800-277-8810, 703-471-5701, or online at eurekavs.com. Wheaton World Wide Moving is one of the world’s most highly regarded providers of transportation services. Wheaton is the fourth largest household goods carrier. Headquartered in Indianapolis, Ind., Wheaton offers private and corporate domestic and international household goods relocation services as well as special commodities and logistic services. The United States Military also is one of the company’s largest customers. To learn more, visit www.wheatonworldwide.com.